A team of reviewers working on behalf of the accrediting agency for Eastern Wyoming College (i.e. the Higher Learning Commission) will visit campus on October 1-2. A Community Member/Constituent Forum will take place on Monday, October 1, 2018, from 4:30-5:30 pm on the Douglas Campus at 800 South Wind River Drive. The reviewers have requested input and the opportunity to hear directly from the community in regards to the educational programming of the Douglas Campus and the needs as a constituent of the institution. This feedback is particularly valuable to the reviewing team. Should this meeting time not work for interested community members, please feel free to email your comments (in confidence) to Kate.Alley@sdsmt.edu. If, for whatever reason, you prefer to visit by phone, please send a day, time, and number to the email address above and one of the team members will contact you by phone. For more information about the HLC visit, please contact the College at 307.624.7000. The Eastern Wyoming College Lancer Rodeo Team just returned from competing in Sheridan, WY, at the annual rodeo hosted by Sheridan College, where the women’s team won the team title. 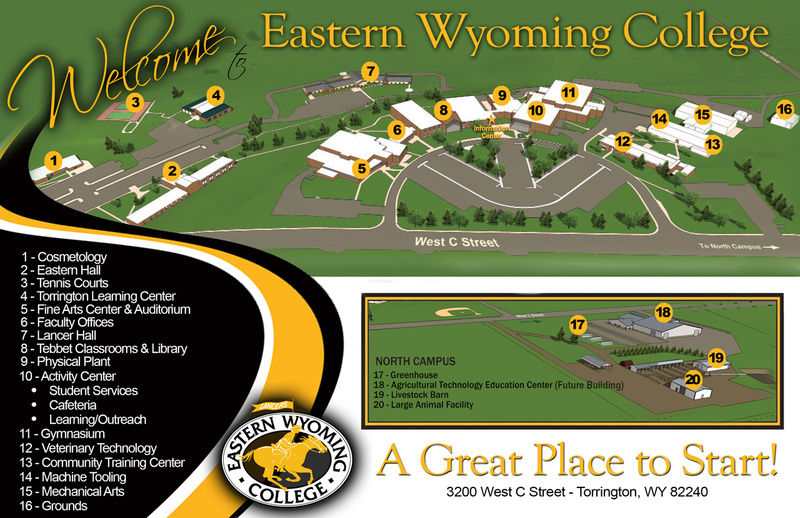 Eastern Wyoming College is offering an Intro to the Internal Combustion Engine class in Torrington, WY. The class will be held Tuesdays, October 2 through November 13, from 6- 7:30 pm. In this class you will learn how each of the different parts of an engine work together to make gas into GO! Disassembled engines and cut-away of real engines (including a Cummins diesel) will be on display in class for you to see, touch, turn and see how different parts work together. Whether you are interested in a career in the industry, wanting to understand your lawn mower better, or just wanting to know if what the repair shop tells you about your car seems right, you will find this class very informative. Class sessions will include some lecture and lots of time for questions and answers. It is open to anyone age 10 and up. Children under the age of 14 must be accompanied by an adult. To register for this class or other classes, please call Donna White in the Community Education office at 307.532.8323. Eastern Wyoming College has been notified that the online associate degree in Early Childhood Education has been recognized as one of the top programs in the nation. The team at TheBestSchools.org reviewed all accredited online Associate’s in Early Childhood Education degree programs in the United States to select the top 35 programs. The EWC program was ranked 16 out of 35. The full ranking article can be found at the following link: https://thebestschools.org/rankings/best-online-associate-degree-early-childhood-education/. Details on EWC’s online Early Childhood Education program can be found on the EWC website at ewc.wy.edu. There’s a new board game in town. It’s called CHIKCAPIG, and as the name suggests it has a farm theme. The first player to get their 6 Chickapigs off the board wins. You must coordinate your Chickapigs, Hay Bales, and the Cow to help your Chickapigs escape through their goal. At the same time, you play defense against your opponents. This chess-like strategy game is highly recommended by Grammy winner Dave Matthews, who takes the game on all his tours. It is a game for all ages, so kids, bring your parents and grandparents. Parent and grandparents get those kids to put down their electronic devices and come play a live, interactive game with you. Snacks provided. This 6-week studio art class is open to anyone aged 15 and older. Drawing is one of the oldest forms of visual expression, used long before any written language. It is the foundation of all artistic practice. Forrest believes that an individual is never too old to learn the Art of Drawing and that anyone who can hold a pencil can learn the fundamentals of Drawing. Forrest has chosen two basic and readily available tools for this class: paper and pencil. And those items will be supplied as a part of your class fees. Sign up and get ready to allow your inner artist out for a breath of air. Women, Ladies, Girls: take responsibility for preparing yourself in the event of a crime—the more prepared you are, the less likely you will need to defend yourself. This class is designed to increase your personal level of awareness, thus reducing the chance you will find yourself in a compromising situation, whether it be at home, in a parking lot, or out jogging. Basic self-defense techniques will be demonstrated with opportunity for practice. Even if you’ve taken this class before, it is always to your benefit to refresh or practice your self-defense skills. Officer Bryan includes the use of pressure points as a self-defense technique in her curriculum. This is a great mom & daughter class. The Veterinary Technology Department at Eastern Wyoming College was pleased to host the 2018 Annual Continuing Education Conference for the Wyoming Veterinary Technician Association on campus on Saturday, September 15. Approximately 50 veterinary technicians, assistants, and students were in attendance from Wyoming, Colorado, Nebraska, and Montana. Speakers for the event included Dr. Kimberly Pattullo, Central Laboratory, Seattle, WA and Dr. Edwin Bittner, Jr., EWC Veterinary Technology Program Director. Dr. Pattullo provided an informative presentation on Cytology. Dr. Bittner presented on Veterinary Immunology. EWC Veterinary Technology students provided campus tours to attendees. …In conjunction with the University of Wyoming 4-H program and Northwest College in Powell, Eastern Wyoming College’s agriculture department hosted Glen Erickson, Logan, UT, to teach students how to synchronize and artificially inseminate sheep and goats. Mr. Erickson has a MS degree in reproduction and was a faculty member at Utah State for 16 years. He learned to AI goats and sheep in Australia, and now has a successful career traveling the country artificially inseminating sheep, goats, and deer. Dr. Georgia Younglove and Dr. Monte Stokes, EWC Ag Instructors, were joined by Ms. Dawn Sanchez and Ms. Meagan Brittingham from UW Extension along with nearly forty EWC students, 4-H and FFA members and their families for the demonstration. Eighteen animals from Southeastern Wyoming were synchronized for timed insemination on August 30th at the Goshen County Fairgrounds. Participants were able to obtain hands-on experience and watch on a TV screen as animals were artificially inseminated using a laparoscope. “This was a highly successful event for 4-H and FFA members that attended and many of the participants are already looking forward to next year,” stated Dr. Monte Stokes, Agriculture Department Head.